Filed to: Lucas and the Snow Dog?Filed to: Lucas and the Snow Dog? Lucas and the Snow Dog? 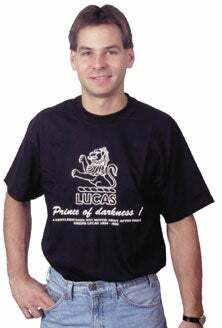 While crossing the bridge to the media center on Saturday at Laguna Seca, we ran across a fellow wearing the shirt at left, bearing the legend: "LUCAS, Prince of Darkness. 'A gentleman does not motor about after dark. - Joseph Lucas.'" When we stopped the man to compliment him, Murilee noted that there are all sorts of things on the web dedicated to Lucas-deriding humor. You can buy said shirt here and peruse selected humorous jabs at Intermittently-Joltin' Joe's expense here. Our favorite? "It's not true that Lucas, in 1947, tried to get Parliament to repeal Ohm's Law. They withdrew their efforts when they met too much resistance." Rimshot, please.